“Our gardens are free to enter and open from dawn until dusk for all to enjoy. In the early sixties, my sister Ruth was a student nurse at Denzell Hospital in Bowdon. She often talked about the train trip from Greenbank to Hale Station followed by the walk up to the hospital, through the leafy lanes of Bowdon and past the sandstone Bowdon Church. When the station was built in 1862, by the Cheshire Midland Railway, it was called Bowdon Peel Causeway. It is now a Grade II listed building. Not surprising, with its Victorian style canopies, footbridge and much-loved signal box. The signal box is not used today but look out for the Hale sign on the box. This was funded by the Mid Cheshire Rail Users’ Association which looks after the passengers’ interests on the Line. The grounds of Denzell Gardens are now a public park and cared for by the Friends of Denzell Gardens and The Devisdale. Retracing that walk made for a lovely morning out. 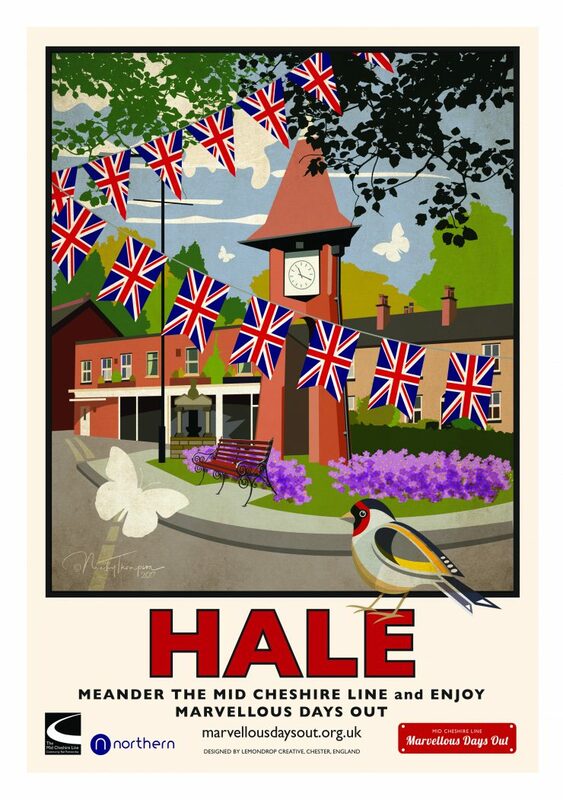 Hale is one of the wealthiest areas of the UK so don’t be surprised if you stumble on a premiership footballer or television celebrity. Around the station you will find chic boutiques with the latest labels and about 20 cafés and restaurants within a 2-minute walk of getting off the train. The 20-minute walk up to Denzell Gardens was well worth the trip. You are nearly there when you pass the Bowdon Lawn Tennis Club on the right. The distinctive black and white Lych Gate is your entrance to Denzell Gardens from Green Walk. Beyond that you will find the stunning Gardens and Denzell House. It is a real hidden gem. You can still walk around the House, but not inside, and it does not take much to imagine how the Cottontots of Manchester lived in the 19th century. Most of the visitors to The Devisdale, which sits beside Denzell Gardens, are dog owners – so why not make your trip to Hale on the train one for your pet dog as well?